Turn the key, come on in, drop your bag... the cabin in Your Neck of the Woods has been waiting for you!!! Enjoy the sights and sounds of Fish Creek in your backyard. This fully furnished cabin features an overlook of Fish Creek with a walking trail to water access; a large deck and yard on creek side with large charcoal grill, Adirondack fire pit with "Meditation rock bench"; picnic table; bench swing; stone path walkway; additional outdoor chair seating; and cozy front porch. This modern cabin is tucked away in the woods, but is just a short drive from area shopping, food and entertainment if you want to venture out. Newly constructed, furnished cabin that sleeps 6-7 with lots of rustic touches and details: 1 Master bedroom with Queen sleigh bed, 1 Loft area with 2 Full sleigh beds; chaise couch that could be used for additional sleeping; 1 full bathroom,full kitchen, breakfast bar (seats 4), kitchen table (seats 4); Living room with view that opens to the deck on creek side. General Information: Open floor plan, ceiling fans, propane heat, city water, Adirondack theme decor. No pets allowed. Smoke free cabin. *Bedrooms: All linens and pillows are provided. Queen has memory foam mattress, full beds have 1 memory foam and 1 pillow top mattress. *Living room/Dining room: Beautiful maple top breakfast bar and kitchen table (seats 8 together),Flat screen T.V. with digital antennae, couch with chaise and additional seating. (Reading material and some games on site; area brochures, maps and menus available). *Kitchen: Full sized refrigerator/freezer with ice maker, microwave, stove/oven, toaster, coffeepot, teapot, percolator, blender, crock pot and misc. cooking utensils, pots and pans, silverware and dishes, some spices and condiments available. Full bath with shower, wall mount blow dryer, bath towels provided (but bring own beach towels and personal items). 7 feet long "Meditation rock bench" located next to Adirondack fire pit, kindling and some firewood available, outdoor cooking utensils for grill or fire pit, outdoor clothesline, Adirondack and folding chairs on premises. Feel free to take a folding chair down to the creek to sit waterside. ***Water shoes for the creek are recommended. Paper & plastic products (cups, plates, silverware, napkins etc. ), Personal items and groceries, charcoal, lighter fluid and additional firewood if desired. Bring own beach towels , floaties/ tubes, life jackets, and don't forget the flashlights, and additional blankets (depending on the season). Bring your OWN floats, tubes, life jackets, kayak /canoe, etc. - Relax in the wooded yard with a picturesque overlook of Fish Creek as you cook out , hang by the fire , or enjoy the Woods Walking trail. -Take a hike down to the beautiful creek side for excellent fishing. -Float, wade, swim or sit out by the water. Explore , admire or photograph some awesome rock formations and nature at it's best in all seasons. -Fish Creek is a favorite of white water kayakers too. -Snowmobiling in the winter (We are right next to Taberg Trailblazers Snowmobile Trail). -Taberg Tower Snowtubing is minutes away. -Adirondack Scenic Railroad, Saranac Brewery Tours and Thursday Night Concerts, Adirondack attractions (43 peaks to climb), Enchanted Forest Water Safari Water Park, Vernon Downs Race Track and Gaming, Turning Stone Casino and Resort, Destiny U.S.A., Fort Stanwix Visitor Center, Erie Canal Village, Capital Theater, Movie Plex , Lake Delta and Verona Beach State Parks , Sylvan Beach Resort, and much more . The bathroom has a whimsical bear theme, towels for six, built in blowdryer, rustic spicket styled faucet, cabinet with mirror, and large shower. 12 cup coffee maker, stove top tea kettle, stove top percolator. Set of 6 plates and bowls, misc. glasses and coffee mugs, utensil drawer with silverware, vegetable peeler, pancake turner and misc. Steak knives in wood block and small cutting boards. Cabinets have knobs made from stones selected from Fish Creek. Dish towels and some spices on site. Misc. games stored in inside compartment of coffee table. Overlook Observation Deck of Fish Creek- (detached from cabin). What to bring: your own food and drinks, personal toiletries, Paper plates, cups, plastic silverware additional charcoal, matches/lighter and firewood (some on premises) flashlights/lanterns cooler Bring your own beach towels, and water shoes reccommended. ------------------------------------------------------------------------------------- For fair weather months, consider own life jackets, fishing equipment, kayaks, float tubes, etc. Clean, well stocked, great location, and very comfortable. Try this place. You will love your stay!!!!! Loved our stay! Great cabin and outside sitting area. Beautiful fall scenery and so peaceful listening to the water. Would absolutely come back! Beautiful cabin and property, and a great place to relax and get away from it all. We will be back! My sisters & I recently spent a few nights at "Your Neck of the Woods" cabin & thoroughly enjoyed our experience there. The cabin itself is beautiful & lacks nothing for a comfortable stay, but it was the setting that we fell in love with. The cabin is well off the road & overlooks Fish Creek. The owners have provided plenty of outdoor seating, a fire pit & dry firewood. There is a trail leading to a stairway down to the creek. It was too cold for us to walk in the creek but it would be a fun thing to do in warmer weather. We couldn't have asked for anything more for our sisters' get together. Our thanks to Brian & Theresa Matt (and Mother Nature) for creating such a wonderful place. 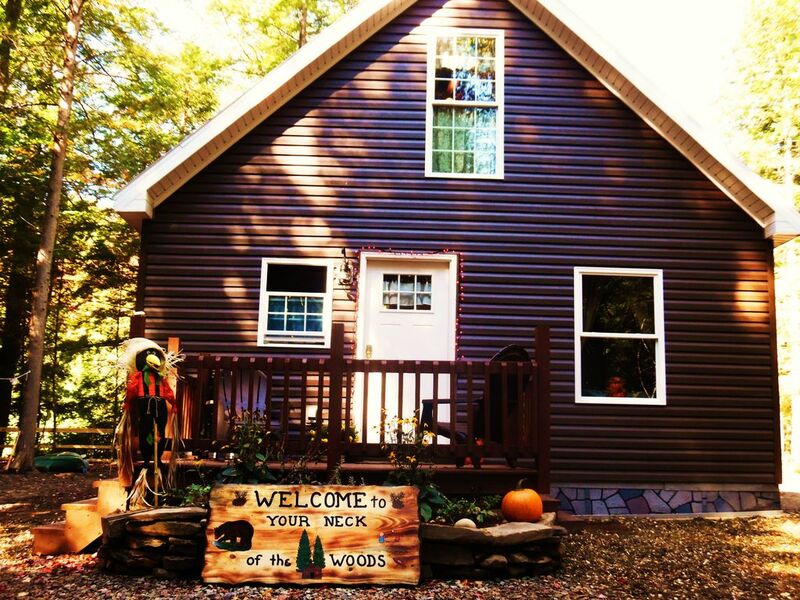 My family of 5 had a great stay at this perfect lil Adirondack retreat. The view and sounds of the creek right in the back yard were wonderful to wake up to and an amazing backdrop for the day and evening. Ample, authentc, wooden Adirondack seating to enjoy the out doors and escape from it all. The stone bench was a great addition and a perfect place to do a couple Sun Salutations. The cabin itself was clean with so much attention to detail in the decor. The kids enjoyed sleeping in the loft and loved the custom staircase. We packed more than we needed as the owners went above and beyond providing linens, paper goods and what not. The owners were very accessible and quick to respond to any questions we had. We would definitely book again and recommend to friends and family. No need to leave this place, everything you need is right here inside and out! We were there seeing family and it was way nicer than staying in a hotel everyone loved it at your neck of the woods. Definitely staying again. It was a beautiful peaceful private place. Wintertime attractions: Great snowshoeing location and access to snowmobile trail. Just minutes from Taberg Tower Snowtubing. Short drive to Rome area activities: ice skating rink, Movie theater, shopping, Capitol Theater performances, restaurants, Lake Delta State Park. Scenic drive to Old Forge area attractions. Syracuse 45-60 min. drive: Destiny Mall, Syracuse University games and area attractions. Please bring own beach towels, water shoes, personal items. Bring own floats or water tubes if desired.